iBank Investor is a great iOS app that allows you to sync your investment data from iBank on your Mac to your iPhone and/or iPad (you can also use iBank Investor as a standalone app). iBank Investor is a free app available on iTunes/App Store. 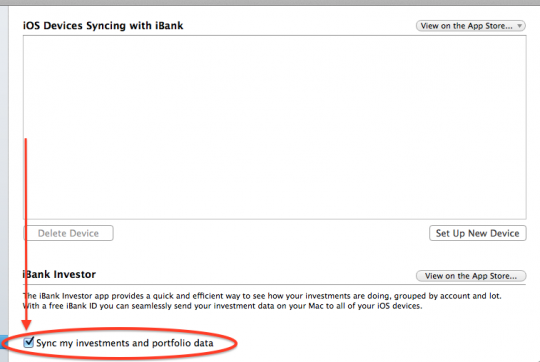 I this example I will illustrate how to set up sync between iBank 5 on the Mac and iBank Investor. To set up syncing between iBank Investor and iBank on the Mac, first you will need an iBank ID (also known as an IGG Account). From iBank 5 on the Mac go to File> Manage iBank ID, click “Continue”, then Sign In or Create your iBank ID. Now open iBank Investor on your iOS Device. From iBank Investor tap “Settings” in the upper-left. From Settings tap “Sign In”. Sign In using the same Login ID and Password as you are using in iBank 5 on your Mac. (note, if you have multiple portfolios from iBank on the Mac you will be asked to choose which file to sync with in iBank Investor). Then you should see your portfolio data from iBank on the Mac loaded in iBank Investor. This entry was posted in Banktivity 5, Banktivity Investor and tagged Sync, iBank Investor.